Maggie May Guitar Chord Chart by Rod Stewart. Welcome to my Maggie May guitar chord chart by Rod Stewart. This is a wonderful song and allows us to get a bit percussive with our guitar if we want to. My favorite kind of guitar playing. The chords used in the Maggie May guitar chord chart are pretty simple. 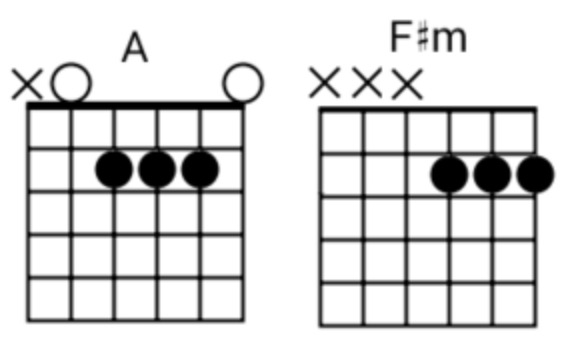 The only barre chord is F#m and there is a simple fix to even get around that. All you have to do is play and A chord on the bottom three strings as shown in the photo below. As always, the easiest way to play any of my chord charts is to play 4 down strums on the down beat. The fancier strumming patterns look like this.